South Korea’s duty-free shops run by family-controlled conglomerates such as Lotte and Shilla posted some 10 trillion won ($8.95 billion) in combined sales last year, nearly 99 percent of total sales, data showed Wednesday. 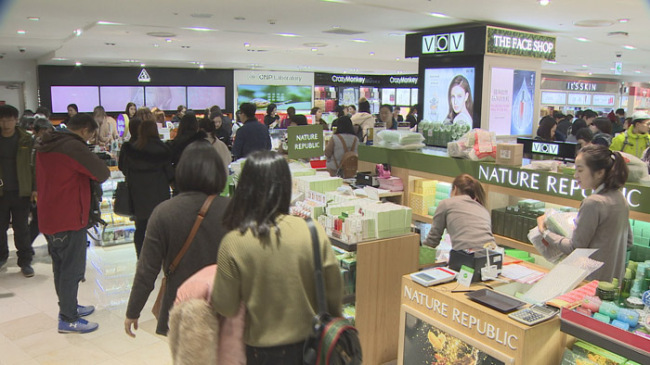 According to Korea Customs Service data quoted by Rep. Park Young-sun of the ruling Democratic Party of Korea, sales of chaebol duty-free stores -- Lotte, Shilla, SK Walkerhill, Shinsegae, Doota, HDC Shilla and Galleria -- came to 10.6 trillion won in the last year, about a threefold jump from 3.6 trillion won in 2013. Their sales accounted for 98.8 percent of the total sales of 10.8 trillion won made last year. The same figure was also above 99 percent in 2013, 2014 and 2015, according to Park. As of the end of August, their combined sales have already surpassed 9.6 trillion won, about 90 percent of last year’s total sales. Meanwhile, duty-free SMEs recorded 126 billion won in sales last year, less than 1 percent of the total sales. As for the first half of this year, Lotte has kept the industry’s No. 1 position with 40.6 percent of market share, followed by Shilla (24.7 percent) and Shinsegae (14 percent). In the intracity duty-free market, Lotte and Shilla together command an 80 percent market share. The current chaebol dominance in duty-free shops was prevalent on online malls as well. For online duty-free retailers, 98 percent of total sales were by chaebol duty-free shops. By brand, Lotte online duty-free shop recorded 1.5 trillion won of sales last year. Shilla saw 886 billion won of sales, which was quadruple that of 2013. Shinsegae saw a 10-fold increase in sales to 570 billion won last year over the same period.